Ozhotels is a group of independently owned and non-related accommodation hotels, motels and resorts located across Cairns Australia. Oz hotels allows you to deal directly with these Queensland holiday apartments and hotels, thus giving you the best possible rates for this Cairns accommodation. Why look anywhere else when you can compare and book your Cairns accommodation online directly with the hotels and save save save!!! Not matter why you are travelling to Cairns you will soon discover that there is a large variety of fully self contained holiday apartments, resorts, hotels and motels available for you to choose from. With such an extensive range of accommodation in Cairns it can be a very time consuming and tedious task to get the most appropriate place for your next business trip or family holiday. Therefore many people prefer to use the services of an accommodation expert like OzHotels in order to help them get a place that suits their specific needs and travel budget. Using this sort of service you can compare hundreds of different properties located right across Cairns and the surrounding areas, ensuring that you are able to find the best property for you. The main benefits of booking online with OzHotels is that you will be able to book up to 12 months in advance and that you will receive an extra discount off the already cheap rates when you stay for a longer period of time. The next time that you are in need of a place to stay in Cairns you can save yourself time and money by booking directly with an accommodation expert like OzHotels. The Ocean Hotels Hides Hotel Cairns is a heritage listed building, that has been restored, whilst still retaining old-world colonial charm. Hides Hotel Cairns offers discounted affordable Cairns accommodation right in the city heart, just a short walk to the Esplanade, Night Market, Casino, Reef Terminal & Kuranda Railway Station. With public transport outside the entrance and tours that collect you from the Hotel, guests can enjoy the Great Barrier Reef, Daintree and all of what Tropical North Queensland has to offer. The wide colonial balcony that front the building provide a unique vantage point to view the city and offer a relaxing place to enjoy your Complimentary Continental Breakfast in the morning or a bring your own refreshment and enjoy the evening twilight. 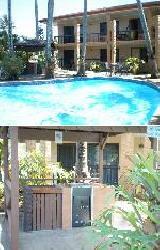 The Hides Hotel Cairns also offers 24 hour reception and tour booking service, guest laundry, valet, limited secured car parking, pool and a 24 hour Internet Cafe or wireless internet in rooms and on the balcony. 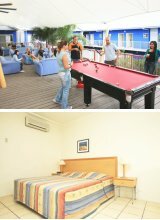 The Northern Greenhouse Backpacker Hostel (formerly the Shooting Star Apartments) is a bright, modern complex situated right in the heart of the Cairns city centre. 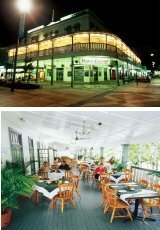 It is within easy walking distance of the many restaurants, cafe's, bars and clubs the Cairns has to offer. 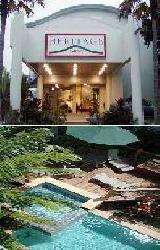 The Northern Greenhouse Backpackers is built around a lovely central courtyard swimming pool, tropical BBQ area and recreation area with pool table. Each of this budget Cairns hostel accommodation features King size dorm beds, ensuite bathroom with shower, balcony, sofa and dining table. 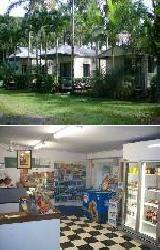 The Northern Greenhouse Backpackers in Cairns provide discount holiday accommodation for those people travelling to Cairns on a budget. All Seasons Cairns Gateway Resort provide comfortable fully self contained studio apartments and motel rooms, making it an ideal destination for your next tropical holiday and all the comforts you need. 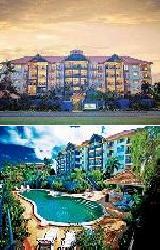 Set on 2 hectres of tropically landscaped gardens with low-rise buildings in Australian Colonial style. Located on the southern approach to Cairns, just 7 minutes drive from the city centre. 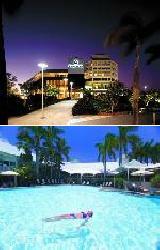 The Aspect Central is one of the most exciting and contemporary boutique Cairns hotels. This trendy Cairns accommodation is conveniently located in the heart of the city centre on the corner of Sheridan and Grove Streets, only 800 metres north of the CBD and 2 blocks from the Cairns Esplanade foreshore. 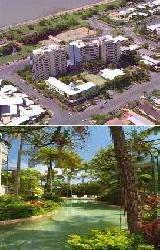 The Cairns Domestic and International Airport terminals are only 3kms drive away from the Aspect Central Hotel. With an attention to superior customer service this budget Cairns accommodation has excellent hotel facilities such as an outdoor salt water reef style swimming pool which creates a feeling of adventure and realism similar to the outer reef. The Aspect Central is popular with business clients, leisure guests, groups, government offices and families because of the tastefully appointed guest rooms at great value discount rates. The rooms at the Cairns Queens Court Hotel are centrally located within the city area of Cairns and provides an excellent base from which to explore everything that tropical North Queensland has to offer. This budget Cairns accommodation complex offers pristine hotel / motel style of rooms as well as fully self-contained studio rooms. The rooms come in varying styles and budgets so everyone is able to find something that suits them. When you stay at the Cairns Queens Court Hotel you will be within a short 10 minute walk to all of the city's major tourist and business attractions. The Hotel Cairns is conveniently located just a 5 minutes walk to the Cairns city centre, casino and the Esplanade with its numerous restaurnats, cafes and eateries. The stylishly appointed air-conditioned hotel rooms at the Hotel Cairns offer travellers superior hotel rooms with cool tiled floors and ceiling fans. All of the hotel rooms have a window or door to allow the cool sea breezes through, flat screen TVs, DVD players, plump beds, sizeable baths and precious touches like indulgent bath products and quality teas and coffee. This great value hotel accommodation in Cairns also comes with free car parking, swimming pool, gymnasium, restaurant and room service, as well as balconies in most rooms which allow you to simply relax on those warm Cairns evenings. Ibis Styles Cairns Hotel and Apartments is just 10 minutes from the Cairns Airport by car and provides easy access to many of Cairns attractions including the Great Barrier Reef, Cape Tribulation and the Daintree Rainforest. The Ibis Styles Cairns Apartment Hotel is one of the most delightful Cairns resorts, set on two hectares of tropical gardens in the heart of the Cairns city centre. 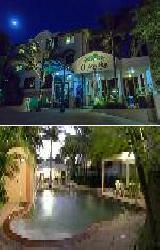 It provides travellers with the choice of Deluxe hotel rooms, 1 Bedroom Loft Spa Suites and 2 Bedroom Apartments. The All Seasons Apartment Hotel Cairns is located only two blocks from the famous Cairns Esplanade and is just a short walk from the Cairns Casino, Reef Terminal, Night Markets and the Cairns Convention Centre. 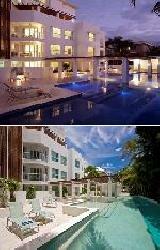 All of the hotel rooms and apartments are set around a beach style swimming pool with its own waterfall. This discount Cairns accommotion also offers a great range of facilities including the Castaway Restaurant, BBQ area, children's playground, tour desk, internet lounge and free parking. The Grosvenor in Cairns offers holiday makers and international tourists great value for money apartment accommodation with a choice of studio, 1 & 2 bedroom self contained serviced apartments that are located on the northern fringe of the Cairns CBD. The Grosvenor in Cairns is close to everything that the city and tropical Northern Queensland has to offer, as well as having a numerous guests facilities and services including direct internet access, faxing facilities, free car parking, guest laundry, fitness equipment, outdoor swimming pool, tour desk, bbq facilities, landscape garden, 24 hour reception, baby cots available and daily housekeeping. Whilst staying at the Grosvenor in Cairns Apartments you can discover the sights and sounds of the rainforest at Cairns Wildlife Dome, get up close to koalas and snakes at Cairns Tropical Zoo or ride the iconic Skyrail and Kuranda Scenic Railway. 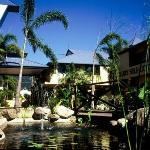 The Cairns Sheridan Hotel provides some of the the very best Cairns accommodation at an affordable price. 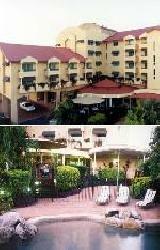 This boutique hotel provides real value for money, but still has exceptional hotel facilities including Kippins Brasserie and Cocktail Bar, extensive gymnasium, outdoor pool, free Internet Kiosk, 24 hour room service, security and undercover parking. Situated just five minutes from the heart of the Cairns city centre the Cairns Sheridan Hotel is a convenient place to stay for business or holiday. All of these Cairns accommodation rooms are superbly appointed and decorated in a distinctive tropical style that provides guests with a restful and pleasing atmosphere. Guests staying at the Cairns Sheridan Hotel can enjoy a walk to the Botanical Gardens and Whitfield Range bush track or take a Great Barrier Reef tour to the reef or nearby islands. Gilligan's Backpackers Hostel and Resort Cairns provides budget conscious travellers with the ultimate backpacker experience. Budget travel doesn't get much better than Gilligan's Backpacker Hotel and Resort which is the perfect blend of traditional backpacker accommodation and discount hotel rooms. 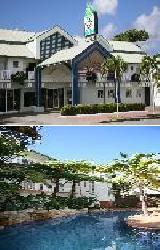 Located in the city centre of Cairns just a few minutes walk to Cairns waterfront lagoon, shopping centres, restaurants, cocktail bars, nightclubs and the Cairns Convention Centre. Cairns provides a great place from which travellers can experience the Great Barrier Reef, Palm Cove and Daintree Rainforest. As a Gilligan's guest you can laze by the swimming pool whilst sipping a cocktail, sample local cuisine, use the internet or gymnasium, meet new friends in the open-air beer hall, book a day trip at the free tour desk or play in the gaming area. The inner-city is also home to the magnificent Cairns Esplanade lagoon lined with sandy beaches, lush grassed areas & picnic tables. 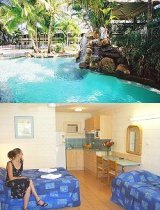 The White Rock Leisure Park specializes in providing budget Cairns accommodation for individuals, couples, families and groups. This budget holiday accommodation in White Rock is centrally located off the Bruce Highway 8kms from the Cairns city centre. 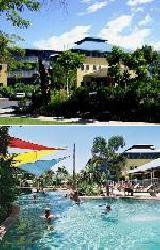 White Rock Leisure Park is set in a pleasantly maintained tropical corner of Cairns, with nature at your doorstep. This share, cabin and villas provide leafy and well established surroundings in which to relax on your next holiday to Cairns. The casual environment of the White Rock Leisure Park offers guests the perfect getaway for families and holiday makers alike who are seeking a budget priced holiday. With a focus and commitment to providing friendly customer service to all guests, White Rock Leisure Park has a list of resort facilities to satisfy all guests including an in ground swimming pool, large undercover BBQ area, fully self contained camp kitchen, cooking and fridge facilities. The staff at White Rock Leisure Park reception can let you know about all of the day tours and trips around the Cairns Region. Whiterock Leisure Park is proud to be the Cairns holiday choice of many international and domestic budget minded travelers. The Oasis Inn Holiday Apartments Cairns is positioned close to the main city shopping centre, Cairns business centre, the Reef Casino, Pier Market place, the beautiful botanical gardens and the lagoon on the Esplanade. It provides budget holiday accommodation in motel rooms, studio apartments and self-contained 1 & 2 bedroom apartments, right in the heart of Cairns. When you stay at the Oasis Inn Cairns Motel & Apartments you not only get great value for money holiday apartments but also easy access to the tropical Cairns beaches including seven mile beach at Paradise Beach, diving in the Great Barrier Reef and the beautiful world heritage listed tropical rainforests of Australia. The Oasis Inn Cairns Motel & Apartments Cairns provides a wide range of facilities including a landscaped saltwater swimming pool set among swaying tropical palm trees, BBQ facilities, entertaining area, free undercover parking, luggage storage, guest laundry, cot hire and wheelchair accessibility. 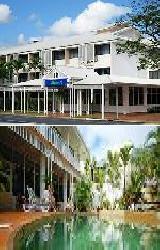 The Cairns Colonial Club Resort offers hotel accommodation & studio apartments resort set amongst 11 acres of award winning tropical gardens, 3kms from Cairns CBD. From the moment you arrive at the resort, you will check right into the holiday spirit. The Cairns Colonial Club Resort features a wide range of modern amenities such as lounge bar, business centre, conference centre, currency exchange services, direct internet access, disabled facilities, faxing facilities, free car parking, guest laundry, gym & fitness equipment, massage, restaurant, room service, sauna, spa, outdoor swimming pool, tennis court, tour desk, bbq, massage room, garden, atm/banking, airport shuttle, security, 24 hour reception, babysitting service, daily housekeeping and beauty salon. With 3 lagoon swimming pools and 2 resort restaurants and all the facilities to be your home away from home whilst you are in Cairns, combining the tranquility of a tropical resort with the advantages of a mainstream hotel. Located in the heart of the city centre the luxury Cairns accommodation provided by the Rydges Esplanade Resort is convenient to everything that Cairns has to offer. Holiday guests can easily explore all the attractions and activities in the city, whilst corporate travellers will be close to all of the major business centres. The spacious and comfortable hotel accommodation at the Rydges Esplanade comes complete with all of the amenities that you need to have a relaxing stay. With the Cairns Convention Centre close by and a wide selection of day trips available to the Great Barrier Reef the Rydges Esplanade Hotel really is the place to stay. Coral Tree Inn Cairns is one of the best budget hotels in Cairns, with everything you might expect for a holiday in the tropics. Ideally located right in the centre of Cairns, opposite a beautiful leafy park, the Coral Tree Inn offers newly built resort-style affordable holiday rooms that are ideal for corporate business travellers and holiday makers alike. 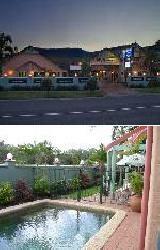 The Coral Tree Inn provides all types of travellers with discount accommodation in Cairns. It also features a wide range of modern amenities and services such as business centre, direct internet access, disabled facilities, faxing facilities, free car parking, guest laundry, restaurant, outdoor swimming pool, tour desk, bbq, massage room, garden, baby cots available and daily housekeeping. With beautiful tropical gardens, fantastic location, exceptional service and affordable rates, the Coral Tree Inn in Cairns provides the perfect accommodation for your next stay in Cairns. 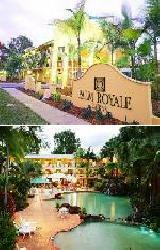 Palm Royale Cairns is a mediterranean hotel resort, surrounded by lush landscaped gardens located in the heart of tropical Cairns. Staying in Cairns offers something for everyone from the reef, rainforest and outback for the adventurous to or just relaxing by the pool for the not so adventurous. The Palm Royale Cairns in Cairns is close to everything that the city has to offer, as well as having a numerous guests facilities and services including lounge bar, direct internet access, free car parking, guest laundry, lift, restaurant, spa, outdoor swimming pool, tour desk, bbq, airport shuttle, 24 hour reception and daily housekeeping. North Cove Waterfront Suites provides a range of 1, 2 & 3 bedroom self contained serviced apartments situated on the Cairns Esplanade waterfront. Set in its own lush tropical gardens, overlooking the Esplanade parkland and the shores of the Trinity Inlet, the North Cove Waterfront Suites & Apartments have a quiet location away from the main central area of noise, but within walking distance to Cairns city centre, restaurants, shops and the Casino. The North Cove Waterfront Suites in Cairns is close to everything that the city has to offer, as well as having a numerous guests facilities and services including direct internet access, faxing facilities, free car parking, lift, spa, outdoor swimming pool, tour desk, bbq, garden, security, baby cots available and babysitting service. Ideal for corporate business travellers and holidaymakers alike, the North Cove Waterfront Suites offers the unsurpassed location of the Cairns Esplanade only minutes walk to central Cairns, shops and restaurants. The 201 Lake Street property in Cairns offers modern King Hotel Rooms, 1 & 2 bedroom self contained serviced apartments that is ideally located just off the famous Esplanade in the cantre of the Cairns CBD. Positioned in the heart of tropical Far North Queensland the 201 Lake Street provides all types of travellers with discount accommodation in Cairns. It also features a wide range of modern amenities and services such as direct internet access, free car parking, lift, outdoor swimming pool, tour desk, bbq and baby cots available. The 201 Lake Street is only a short stroll from the central business district of Cairns, the Esplanade and the main Cairns shopping precinct, making it perfect for tourists, holiday makers and corporate business travellers alike. The Getaway On Grafton offers 2 bedroom self contained apartments & townhouses located along the famous Esplanade in the heart of the Cairns City Centre. This affordable Cairns holiday accommodation is perfect for the families, inviduals and corporate travellers because the central location makes it ideal to take advantage of everything that the city has to offer. It features numerous guests facilities and services including direct internet access, faxing facilities, free car parking, spa, outdoor swimming pool, tour desk, bbq and baby cots available. The Getaway on Grafton Apartments Cairns are perfect for tourists looking for a great location at the edge of city centre within a short walk to the Esplanade with the beautiful Muddies Playground, Lagoon Pool, Restaurants and Night Life. The Tradewinds McLeod Holiday Apartments in Cairns offers self contained 2 bedroom serviced apartments at budget prices superbly located in a quiet environment on the fringe of the Cairns city centre. 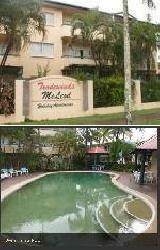 Tradewinds McLeod Apartments are ideal for tourists to this beautiful city in the heart of Far North Queensland. The Tradewinds McLeod Holiday Apartments in Cairns is close to everything that the city has to offer, as well as having a numerous guests facilities and services including business centre, direct internet access, faxing facilities, free car parking, outdoor swimming pool, tour desk, bbq, garden, security and baby cots available. Tradewinds McLeod Holiday Apartments, Cairns rests peacefully away from the main roads of Cairns, and is an enjoyable twenty-minute stroll to the main activity of the Cairns city. The affordable rates and quiet location affords relaxation and accessibility for families visiting Cairns and tropical Far North Queensland. The Best Western Plus Cairns Central Apartments provides travellers with the choice of hotel accommodation, as well as 1 & 2 bedroom self contained serviced apartments. These affordable Cairns apartments are ideally situated in the heart of Cairns, right across the road from Myer and Cairns Central Shopping Mall. The property is also within easy walking distance to the famous Cairns Esplanade, city beach, night markets, Cairns Convention Centre, Reef Casino and night clubs. The Best Western Plus Cairns Central Apartments in Cairns features many facilities and services including conference centre, direct internet access, faxing facilities, free car parking, guest laundry, lift, massage, restaurant, spa, outdoor swimming pool, tour desk and baby cots. The Mid City Luxury Suites in Cairns provides travelers with elegant holiday accommodation that is located in the heart of the Cairns city. This places the Mid City Luxury Suites central to all of Cairns major tourist attractions including the Esplanade, casino, shops, cafes, nightlife entertainment and numerous restaurants. The accommodation at this Cairns property consists of comfortable and affordable one bedroom self contained serviced apartments that are located on the 2nd and 3rd floors of the property. The guest facilities at the Mid City Suites Cairns include an outdoor swimming pool, Spa, BBQ facilities, entertaining area, landscaped gardens, housekeeping daily, tour desk, dry cleaning service, luggage storage, baby cots, in-house dining available by order in from local restaurants, FREE security car parking and extensive business facilities. The Heritage Hotel provides modern and contemporary Cairns accommodation right in the heart of city centre, only 10 minutes from the Cairns airport and a short stroll from the world class Cairns Esplanade with it numerous restaurants, cafes and bars. The professionally trained staff at the Heritage Hotel Cairns will greet you with a genuine warm and friendly welcome, helping to make your stay in Tropical North Queensland a memorable one. All of these Cairns hotel rooms are non smoking, air conditioned and serviced daily. All the facilities one expects from International class hotels are right here including an outdoor pool, spa and an outdoor BBQ area. 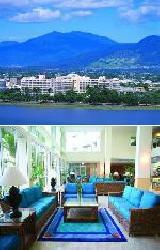 The quiet location of the Heritage Hotel Cairns affords close city proximity without the city noise. As a base from which to explore the wonderful sights and experiences of the Tropical North this discount Cairns hotel is one of the best. Stay at the Heritage Hotel and experience the difference. Spacious motel rooms with traditional teak timber decor and quality fittings, electronic security locks, voice mail, conference room, swimming pool with children's crocodile slide, popular Seafood restaurant and bar. We have a guest laundry for your convenience. Hire cars available if you want to travel further afield and check out Trinity Beach, the Daintree Rainforest or Kurunda. The friendly office staff at the Cairns Southside International Inn can help with your day tour bookings, most with free pick up and drop off at the door. 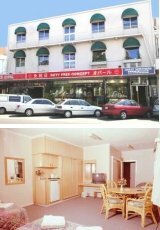 3.5 star motel located walk distance to city and major shopping centre. Spacious rooms with modern decor located around central swimming pool and spa, amid lush tropical garden, most rooms have balcony or verandah area to enjoy our climate all year round. Restaurant and bar on property, room service or dine in. The Nomads Cairns Backpackers Hostel Resort was formerly known as the Serpent backpackers and offers a budget place to stay with share dorm rooms and private hotel rooms. 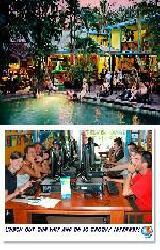 Nomads Cairns Backpackers Hostel Resort is the ultimate tropical backpackers hostel located in the heart of the Cairns CBD, just minutes from major transportation and Cairns attractions including the famous Esplanade Lagoon. 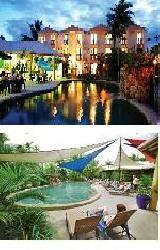 The Nomads Cairns Backpackers Hostel provides all types of travellers with discount accommodation in Cairns. It also features a wide range of modern amenities and services such as lounge bar, direct internet access, free car parking, guest laundry, restaurant, outdoor swimming pool, tour desk, bbq and airport shuttle. The private double, twin and king hotel rooms are ideal for those looking for extra comfort and privacy at a fantastic price. Cairns is the gateway to the Great Barrier Reef, including everything you need to enjoy Tropical North Queensland in style. Located in the heart of Cairns and just a short stroll from the Convention Centre, Reef Casino & Trinity Wharf is Pullman Cairns International. Guests will be able to relax and enjoy the style, comfort and luxury of this Cairns hotel as they explore all the sights and attractions of the city and local region. Take a tour to the Great Barrier Reef, visit the beautiful Queensland Daintree Rainforest or experience the fresh local produce at the Esplanade restaurants when you stay at this deluxe Cairns hotel accommodation. Offering the ultimate tropical escape and five star indulgences the Shangri-la the Marina Hotel is designed with complete comfort and luxury in mind and offers a new level of hospitality and unsurpassed accommodation in Cairns. The Shangri-la has a unique waterfront location on the historic Marlin Marina above the Pier Shopping Complex and Dining Promenade of Cairns. This location also allows this luxury Cairns accommodation to provide guests with panoramic views overlooking either the city, surrounding mountain ranges, lush tropical gardens, Trinity Bay or the Marlin Marina. This prestigious international hotel is a short 5 minute walk from the Cairns Convention Centre, 10 minutes drive from Cairns International Airport and a short stroll to the Esplanade swimming lagoon, city centre and Great Barrier Reef Departure Terminal. The Bohemia Resort Cairns provides tastefully appointed rooms at very affordable rates with many lifestyle and business facilities to ensure that your stay is both comfortable and memorable. This budget accommodation features backpacker hostel style dorm rooms as well as hotel rooms and even 3 bedroom self contained apartments. Due to this wide range of accommodation options the Bohemia Resort Cairns is perfectly suited for singles, families, business travellers, sporting groups and holiday makers. The Bohemia Resort Cairns is conveniently located just 1.5kms north of the Cairns city centre and approximately 1.5kms south of the Cairns domestic and international airport. It is also only 3 blocks from the famous Cairns Esplanade foreshore and provides a fantastic base from which to explore all of the great things that Tropical North Queensland has to offer including the Cairns Night Markets, Reef Casino, Port Douglas, Daintree Rainforest, Cape Tribulation, Skyrail Rainforest cableway, Kuranda, Atherton tablelands and the Great Barrier Reef. Nestled amongst an acre of lush tropical gardens in the very heart of Cairns is the Bay Village Tropical Retreat. 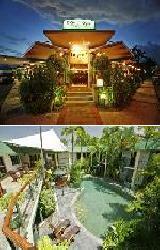 Guest will really love the superb location and comfort of this family owned Cairns accommodation hotel. With a selection of hotel and fully self contained apartments this Cairns resort provides that personal touch to your tropical North Queensland holiday including a relaxed informal atmosphere and award winning gardens. This resort style Cairns accommodation boasts a free form swimming pool, poolside cocktail bar, BBQ facilities and fully licensed a la carte Balinese restaurant where you can enjoy the best food and boutique wines amid tropical surroundings. Further hotel facilities include a guest laundry, courtesy airport transfers, internet room for guests, free on site car parking, tour desk, safety deposit, room service, concierge and dry cleaning/laundry service. The Cairns accommodation provided by the Comfort Inn Canon Park is ideally positioned just out of the city centre and with shops, cafes, bars and restaurants within easy walking distance of the property. Cannon Park Race Course is located opposite this Cairns hotel and the picturesque Cairns Foreshore Esplanade is a short 15-minute drive away. All rooms at this budget Cairns property are well appointed and feature air conditioning, room service and satellite television. The Comfort Inn Canon Park also features a swimming pool, BBQ area, tour desk, free car parking and guest laundry for your convenience. If you are after luxury Cairns accommodation in the heart of the city centre then why not stay at the Rydges Tradewinds Hotel. With great value discount rates, spacious hotel rooms and a convenient location so close to the city the Rydges Tradewinds really is a great value place to stay for your next business trip or family holiday. Explore all of the attractions and activities that Cairns has to offer including the Great Barrier Reef and Daintree Rainforest from this quality Cairns property. A funky Cairns city backpacker hostel located in the heart of tropical North Queensland the Calypso Inn Backpackers provides the budget conscious traveller with friendly, clean and safe place to stay in Cairns. This modern, sophisticated backpacker hostel has 3 different types of budget accommodation; dorm share, double share and twin share. Ideally housed in a tropical garden setting with swimming pool, friendly staff and superb facilities the Calypso Inn Backpackers Resort will be the highlight of your trip to Cairns, Australia. The popular Zanzibar Bar & Grill comes alive at nightime with excellent cheap food, funky music and a great social atmosphere. The best thing about this hostel, except for the great city location is the excellent array of facilities and services, such as air conditioning, free safe/storeroom, tour booking office, broadband wireless internet access, communal kitchen, 24 hour security and guest laundry. 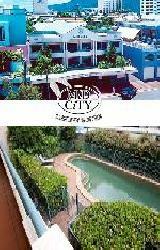 All rooms have private balcony with street or pool. Spacious with modern decor. Enjoy our year round climate while dining or enjoying a cocktail at Julians restaurant and bar located around the swimming pool and cascading waterfall. Enticing rooms, spacious suites, stylish facilities and enthusiastic committed staff make your stay at Rydges. Offering modern resort style accommodation, the Cairns New Chalon Hotel is fantastically located for your stay in North Queensland. All rooms are next to a large resort style pool and beautifully landscaped tropical gardens and have been stylishly refurbished and offer all conveniences for a comfortable stay. 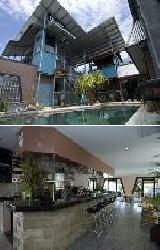 There is also a poolside restaurant and bar to enjoy. As you arrive in Cairns from the south the property is ideally located in Woree, only 4 kilometres from Cairns city centre, directly opposite Cairns Golf Club and only a 10 minute drive from Cairns northern beaches. 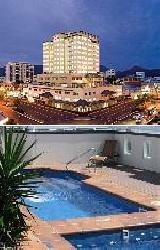 The Great Northern Hotel is an affordable 3 star hotel situated in beautiful, downtown Cairns. Stay in the heart of the Cairns Central Business District and enjoy this budget priced hotel, complete with air-conditioning, complimentary inhouse movies, cocktail bar and 24 hour friendly service. 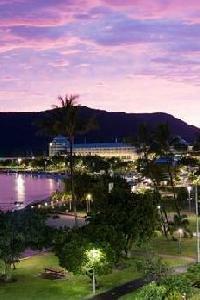 The Great Northern Hotel is only metres away from most of Cairns greatest attractions. 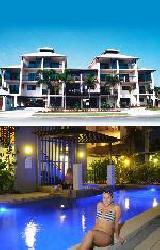 Also only a short walk away is exceptional dining, shopping, entertainment and the Esplanade swimming lagoon. 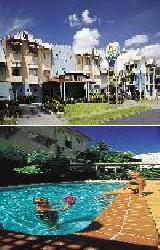 So enjoy the home away from home feeling when you next stay in this discount Cairns accommodation. The Northern Queensland city of Cairns and the surrounding regions have plenty of different places to stay that are perfect for short or long term holidays. These include the Cairns Resort Hotels By Outrigger, Hilton Hotels Cairns, Sofitel Reef Casino Hotels Cairns, Breakfree Trilogy Resort, Pacific International Hotels Cairns, Lakes Cairns Resort Accommodation Cairns and the Sea Change Beachfront Apartments. In order to book in at these or any of the other holiday accommodation in Cairns then click here to make an enquiry.